I got almost twice as many backlogged reviews done this month as my goal, but I still didn't write anything at all this month (other than blog posts). The hat I knit was a more time consuming one than normal with loops all over. I didn't get to do my Day 3 lesson as soon as it came in today since it was a rather busy, run around kind of day. Today, I learned how to add beads to my cord. I used the crochet hook to pull the thread through the hole in the bead and then made the cord the same as I did yesterday. In order to keep the bead in the middle, the stitches following it are done with looser tension. I found that using my hands for adjusting the tension on this part worked better than the crochet hook. 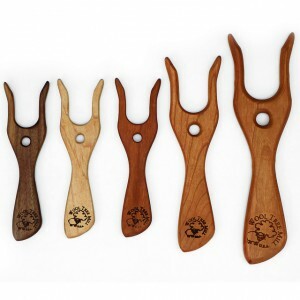 I found out that I won a Wool Tree Mill lucet!! I am so excited for it to come and looking forward to how nice it will be for making cords. I am getting the Fine size in walnut (the first one in the picture). I anxiously waited for my email to arrive with the details for Day 2 of the 7 Day Lucet Challenge. When it finally arrived, I pulled out my fork-turned-lucet and got to work. It was really easy to learn and quite addictive! It is nice that I can hold the yarn/thread the same way I do for tatting, crocheting, and knitting. I wasn't sure how big of a cord would be able to fit in the hole I drilled in my lucet (I used the biggest drill bit I could find on my husband's work bench) so I started with crochet cotton. I decided to try making some cord using the worsted weight yarn I'd just used to finish a slipper right before my Day 2 email came in. It was REALLY fast to make a cord using that and is super soft. My 2 cords. The brown one only took 5 minutes to make! You can see the varying tensions, but not bad for a first try. I tied them on my wrist as bracelets. I discovered a 7 Day Lucet Challenge today (it started April 1st). I've been wanting to learn to use a lucet, and although I don't think it will be difficult to learn, I haven't taken the time to learn previously. I figured the challenge was a good time as any to start! The first day was just to gather supplies. I don't have a lucet (yet) so I went through my kitchen drawers and found a couple of options of things that might work. Both options aren't the greatest, but I decided to go with altering a wooden fork rather than the plastic fork as the plastic one's tines are quite wobbly. My supplies. The two possibilities for a lucet are on the left. I put everything in a little container for ease of use. The lucet doesn't fit, but I could shorten the handle so it can if I decide I want it to. My finished lucet. Not perfect, but it should work. The Cloaked Bandit has been robbing the nobility for the past three years. No one realizes that the thief is none other than the rightful heir, Juliana Wessex, who is stealing to provide for the peasants her uncle has taxed into poverty. When a couple of urchins rob Collin Goodrich, he is surprised to realize one of them is actually a woman. He trails them to find out who she is and is surprised to discover it is someone he knew from childhood, Juliana Wessex. He finds he wants to protect her and get her to leave her thieving ways so he challenges her to stay at his house with his sister and him for a week and return to her former identity as a proper lady. Will Juliana overcome her dislike of nobility and find love with Collin? I didn't realize at first that "A Daring Sacrifice" is the "sequel" to "An Uncertain Choice" as there is no series name given. It could be read on it's own, but it would be a little clearer what they were talking about with the "contest" from "An Uncertain Choice" if you read them in order. I didn't really pay much attention to Collin in the first book as he wasn't the hero that I was rooting for to win the contest. 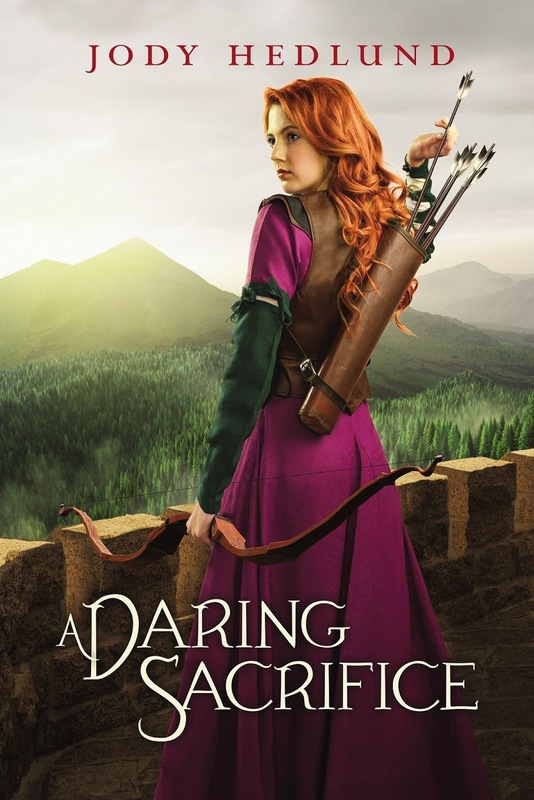 "A Daring Sacrifice" is a teen romance but I enjoyed it. 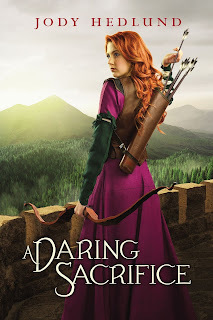 At first, I was wondering if it would be too similar to Melanie Dickerson's "Huntress of Thornbeck Forest", but other than the heroines both being "Robin Hood" characters who provide for a band of poor people, they each had their own storylines, which was nice. With this story being geared for teens, the romance isn't as deep as some books, but I didn't find it childish, either. I was originally going to let my daughters read this, but there were two phrases in the book that changed my mind. They were: "In fact, if I'd been someone more sinister-a lusty man without any regard for her womanhood-what would she have done tonight?" and "My blood ran cold at the thought of what Lord Wessex might do to her, of the torturous ways he'd violate her." At 11 and 10, they wouldn't understand these and I don't think they need to know what they are talking about. I will wait until they are older to let them read it. There are some mentions of torture, but not really too graphic. Unless the reader is already familiar with what being drawn and quartered is, it wouldn't mean much to them. There are a few mentions of bloody or mutilated bodies, but I didn't really find them overly repulsive. I liked how the parts of the book for Collin were a different font than the sections for Juliana. It made it easier to follow who was talking since the book was all in the first person point of view. I received a free copy of this book from the publisher through their zblogsquad program in exchange for my honest review. All thoughts and opinions are my own and no other compensation was received. 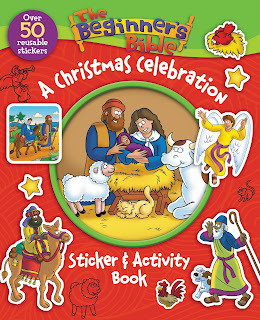 Book Review: "The Beginner's Bible: A Christmas Celebration Sticker & Activity Book"
"The Beginner's Bible: A Christmas Celebration Sticker & Activity Book" has more than 50 reusable stickers and a lot of different types of activities. 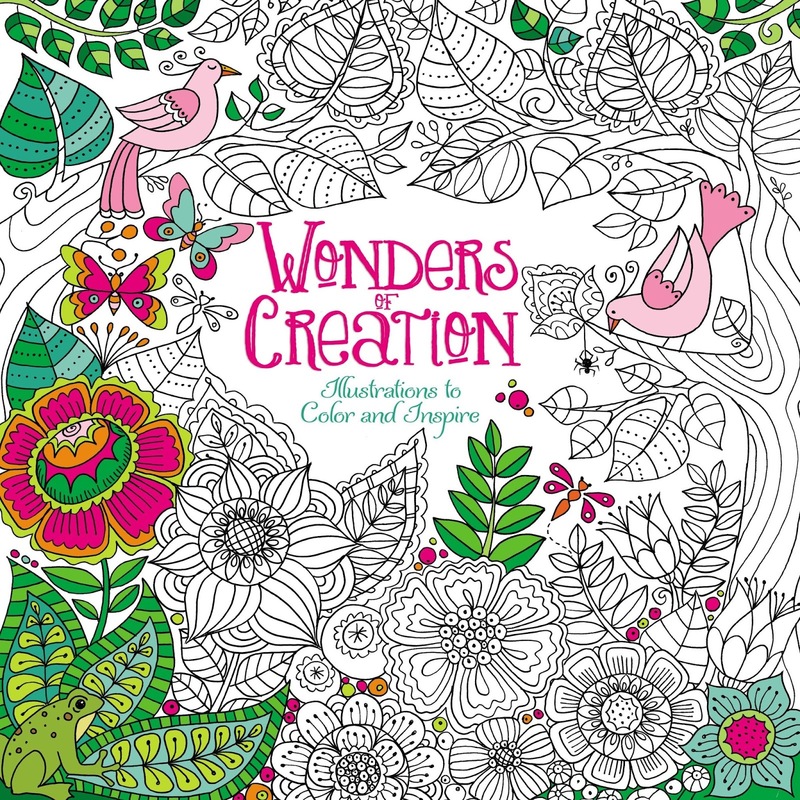 Included are hidden pictures, mazes, word searches, coloring, dot to dot, and more. 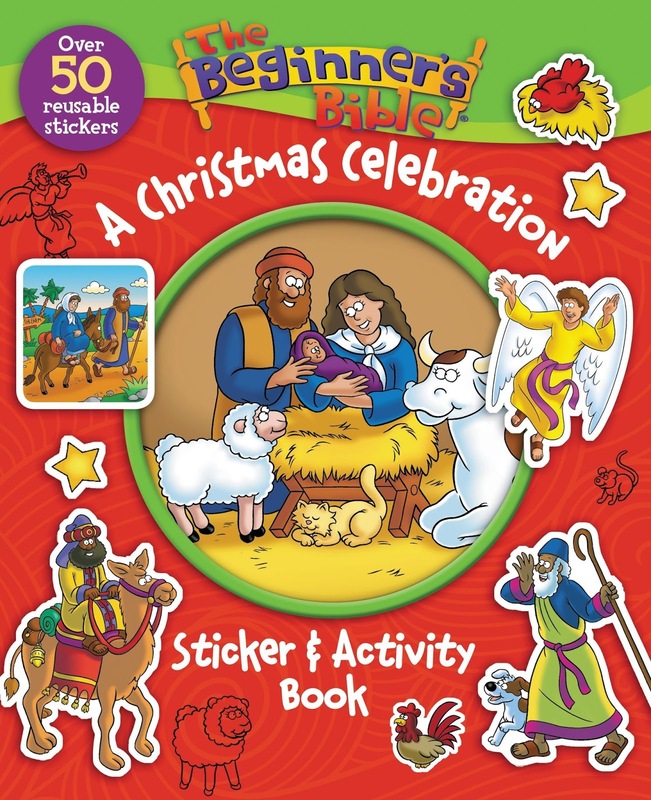 The book starts with Mary's visit from the angel, follows Mary and Joseph to Bethlehem, the shepherds' visit, Jesus' dedication at the temple, and ends with the Wise Men coming. The pictures are very bright and colorful and fill the pages. I really liked that they show the Wise Men being there when Jesus was a toddler which is true to the Bible and not having them come to the manger. The variety of activities is very nice. The stickers are a little thin and rip easily if you aren't careful. 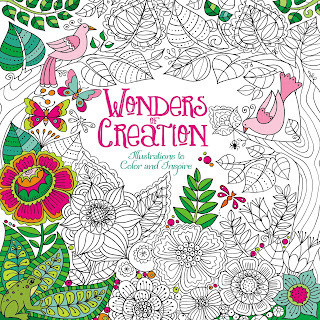 "Wonders of Creation" from Zondervan is an awesome book. It is a large size (10 x 10 inches) with heavy duty paper. The pages are double sided with pictures to color on both sides, so you'll want to test to make sure what you color with doesn't bleed through. Most of the two page spreads coordinate with each other, either with them having similar themed animals (both from the desert) or one complete picture spreading across both pages. There are a variety of types of animals from common (ie. squirrel) to less common (ie. sloth). Some of the pages feature fanciful representatives of the animals and others (most) are realistic. The intricacy of the designs also varies throughout the book with some of the pages having more details and others are more simplistic. This book will give hours (months?) of coloring. I received a free copy of this book in exchange for my honest review. All thoughts and opinions are my own and no other compensation was received. 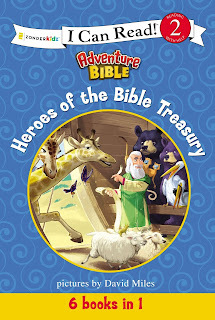 Book Review: "Adventure Bible: Heroes of the Bible Treasury"
This book tells the story of Noah. I was glad that it told how God brought the animals to the ark since that is what it says in the Bible. One thing I wondered about, though, was that it said that after the animals and Noah and his family were on the ark "God closed the window tight". In the Bible, it mentions that God closed the door. The illustrations were beautiful and reminded me of colored pencil pictures. Many of the pages are completely covered with color making the book visually appealing. There was one picture I didn't like as it shows that suddenly the whole side of the ark is covered in windows and the animals have their heads sticking out. This is more the modern rendition of the ark and I didn't like seeing it in the book that followed the Bible otherwise. At the end of the book is a "People in Bible Times" section that tells a little bit more about Noah and a "Did You Know?" section that tells about the size of the ark. 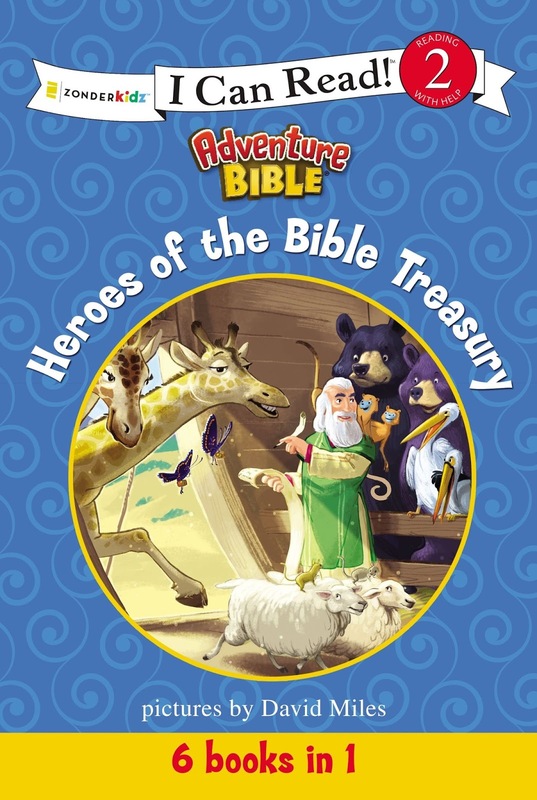 This book follows the Biblical account of Joseph. It tells how he got the coat of many colors, told his brothers about his dream, was sold into slavery in Egypt, and eventually was instrumental in saving a lot of people's lives with the saving of the grain from the plentiful years. It gives a very abreviated version of Joseph's time in slavery. In fact, it skips right over it. It says Joseph was sold to a rich man and the rich man put him in jail, almost as if he went straight into prison. It also says that Joseph was the youngest, when Benjamin was the youngest brother. The end of the book has a "People in Bible Times" about Joseph and Jacob and "Life in Bible Times" about the coat of many colors. This book tells the story of Moses from the burning bush to the Egyptians drowning in the Red Sea. It does not spend much time on the plagues, just listing them in order. It does tell more about the 10th plague and how the Israelites obeyed God and were not affected by it. The book shows God's protection of his chosen people in the wilderness. It did not make it very clear that Moses was also an Israelites. It just says he knew them as he had lived in Egypt. The "People in Bible Times" at the back of the book does say he was a Hebrew, but the story itself is confusing on that score. It also says that Moses packed up his family and brother and went to Egypt. The Bible did say that Aaron was coming to meet Moses, but before that, I'm pretty sure he was still living in Egypt like the rest of the Israelites. The book also has a "Words to Treasure" section in the back. This book tells the story of Elijah from when he told Ahab that it wouldn't rain through the showdown between the prophets of Baal and Elijah on Mount Carmel. The book does not make it clear that God sent Elijah to the widow woman with the oil and flour. It makes it seem like he was just out for a walk one day and came across her. I liked the detail it gave to the encounter on Mount Carmel and God's showing that He was the true God. The back of the book has a "People in Bible Times" about Elijah and a "Life in Bible Times" about what a prophet was. This book tells the story of Esther. It followed the Biblical story but left out some of the aspects of the story such as why King Xerxes was looking for a new queen. It also makes it seem that Esther was the only girl brought to the palace. It also did not say why Esther was in danger if she went to the King. When we read the story, I talked about these portions of the story that the book did not cover. The illustrations were beautiful and reminded me of colored pencil pictures. At the end of the book is a "People of the Bible" section that tells a little bit more about Esther and Mordecai and a "Did You Know?" section that tells about the festival of Purim. In this book, it starts with Saul and his hatred of Christians and throwing them in prison. Then Saul encounters Jesus on the road to Damascus, is converted and changes his name to Paul. The book also tells a little about Paul's life after his conversion. The pictures are nice, although a little more muted than some of the other books in this series. The back of the book has "People in Bible Times" about Saul/Paul and "Did You Know" about Paul praying. I like having books that I can let my children read and know that it is teaching truth. It is a Level 2 reader which stands for "Reading with Help-high interest stories for developing readers". Many of the pages are completely covered with color making the book visually appealing. Even though I had previously reviewed "Noah's Voyage" and "Brave Queen Esther", it is nice to have the books all together in one volume. My son loves to read these stories. The addition of a table of contents would make this book even better so you could find the individual stories better. I received a free copy of this book to review. All thoughts and opinions are my own and no other compensation was received. 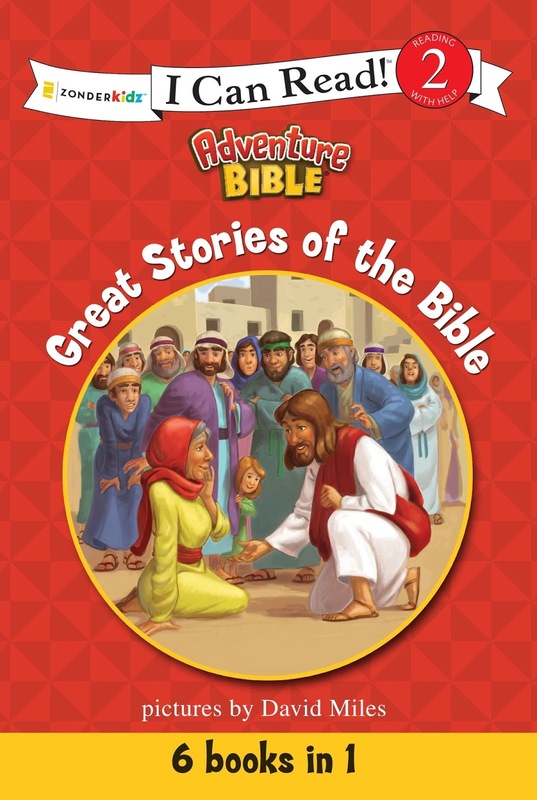 Book Review: "Adventure Bible: Great Stories of the Bible"
I previously reviewed the last four stories as the stand alone books. This book tells the story of the seven days of creation through the fall of mankind and their banishment from the Garden of Eden. The illustrations were colorful and similar to colored pencil drawings. I wasn't sure why one picture has Eve with her hand in an elephants mouth, though. I liked that they didn't make the fruit on the tree of the knowledge of good and evil as an apple, but some odd fruit that sort of resembles blue pomegranates. A couple of things made me pause in this story (it says God told them to use all you see with respect. It seems a bit "mother Earth" to me. God told them to tend and keep the garden. Also, it says that angels were sent to care for the garden when Adam and Eve had to leave. The Bible says that God posted angels to guard the way into the garden, but doesn't say anything about them taking care of the garden), but overall, I liked the story. The end of the book has "People in Bible Times" about Adam and Eve and "Words to Treasure" that talks about how we don't know what type of tree the Tree of Life was (although it seems like it seems like is should be about the tree of the knowledge of good and evil, since that is what they weren't supposed to eat). This book starts with telling how some people in Israel worshiped other gods and that King Nebuchadnezzar captured the city and brought Jews back to Babylon and how he chose young men to work for him after being trained for three years. It then jumps to Nebuchadnezzar building the golden statue and ordering everyone to worship it when the music plays. I liked the brief synopsis that tells how Hananiah, Mishael, & Azariah (aka Shadrach, Meshach, & Abednego) came to be in Babylon. The pictures were engaging and colorful. One does show Nebuchadnezzar and a worker in the doorway of the furnace which wouldn't have worked as the men who threw the three men into the furnace died from the heat coming from the furnace. The end of the book has "People in Bible Times" about Nebuchadnezzar and "Live It!" about trusting God for all things. This book is a simple retelling of the story of Ruth and Naomi from the Bible. As with other books in this series, it has bright colorful pages and easy to read sentences. The book mostly follows the Biblical account of the story with some simplification (it doesn't talk about the Kinsman redeemer aspect). There were a few things that bugged me about the book, however. First, it opens with Elimelech, Naomi, Mahlon, and Chilion pictured at home in Israel. The boys appear to be about 4-6 years old. It says that they "had to move far away". The Bible just says that they moved to Moab and I always got the impression it was a lack of faith that caused them to leave. But that could be my own opinion, I guess. But the very next page in the book mentions "one day...Naomi's husband died and later, her sons died, also". No mention of the ten years they'd been there and suddenly there are wives of the sons. It is confusing as to why there are wives when the boys seemed to be so young. I thought that would be confusing to kids. When Naomi returns to Israel, the book says she was happy to be home. The Bible seems to disagree since Naomi told everyone to call her Mara which meant "bitter" (doesn't seem to happy to me). Also the book says that Naomi was so thankful that Ruth and Boaz got married that she jumped in the air. I felt this was quite a stretch from the Biblical account. 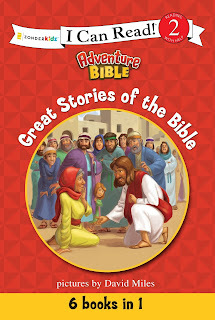 Overall, I thought the book was nice and would be good for beginner readers to be able to read stories from the Bible. I would just recommend having them read it to you so you can supplement and explain further. "Miracles of Jesus" tells about some of the miracles of Jesus. It has two chapters. The first tells the story of Jairus' Daughter. This also included the part of the story where the woman touches Jesus' robe. I found it to be Biblically accurate. The other chapter tells of the Feeding of the 5000. It also followed the true story in the Bible.The illustrations were beautiful and reminded me of colored pencil pictures. Many of the pages are completely covered with color making the book visually appealing. At the end of the book is a "Did you Know?" section that lists some more of the miracles Jesus performs and a "Words to Treasure" section that gives a Bible verse. "A Father's Love" tells the story of the Prodigal Son. I found it to be Biblically accurate. The illustrations were beautiful and reminded me of colored pencil pictures. Many of the pages are completely covered with color making the book visually appealing. The end of the book has a "People in Bible Times" witha verse and "words to Treasure" about how God values family. "The Good Samaritan" doesn't just tell the story of the Good Samaritan, but starts with Jesus teaching the people and being questioned by a "very smart man". Jesus then goes on to tell the story of the Good Samaritan. The book then ends with Jesus asking the man who the neighbor was in the story. At the end of the story, there is a "People in Bible Times" page that gives a key verse, "What is a Samaritan" and "Words to Treasure". The What is a Samaritan portion didn't really give much information. It says that a Samaritan lived in Samaria and then says that Jews and Samaritans were foreigners and didn't know much about each other, so they didn't like each other. This isn't the reason they didn't get a long at all, and I think they should have just left it out if they didn't want to mention that Jews didn't like Samaritans because they were descendants of Jews who had married Gentiles. Other than that, I liked how the book followed the Biblical account. The pictures are colorful and go along with the text well. At one point, it says the Samaritan forgot that Jews and Samaritans didn't like each other. This makes it sound like it slipped his mind rather than he chose to ignore the fact that the two groups didn't get along. I am glad for stories that I can let my children read and know that it is teaching truth. It is a Level 2 reader which stands for "Reading with Help-high interest stories for developing readers". I think that the book should have a table of contents so that it is easier to find each individual story in the book. Even though we own more than half of the books in this collection already, it is nice to have them all in one spot. My youngest son loves being able to grab this book and being able to read through the stories with minimal help. I received a free copy of this book in exchange for my honest review. No other form of compensation was received and all thoughts and opinions are my own. 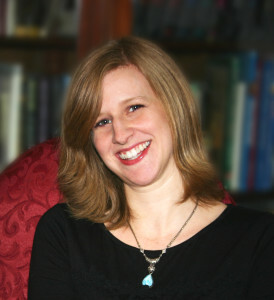 Rowena Kinnaird has never felt good enough for anything, not even the air she breathes. When she seems to have no one to count on, will the Duke of Nottingham be her way of escape? But what will he do when he realizes the reason she needs to get away? When she starts to open up to him, will the gems he's hiding come between them? 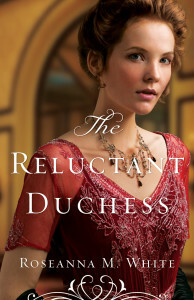 When I found out I'd be participating in this blog tour, I requested the first book in the Ladies of the Manor series from the library, but it did not come in, so I just started with "The Reluctant Duchess" which is book 2. I would definitely recommend starting with the first book so you get the whole story right from the beginning. That said, I didn't feel completely lost while reading this book as it filled in the backstory well. I liked Rowena and Brice and Ella. I kept feeling suspicious of the secondary characters as I tried to find out who was working against Brice and Rowena. Once I picked up the book, I didn't want to put it down. It did take a bit to get used to the Scottish way of talking and some of the unfamiliar words, but context makes it clear what they mean. I really liked the focus on following the Lord's direction throughout the book and watching the characters spiritual growth. I am looking forward to reading the 3rd book in the series when it comes out. I went to great pains in The Lost Heiress to make Brice Myerston a favorite character, so that readers HAD to read his story. Mwa ha ha ha. So far, so good on that score! Brice is a hero who has his faults, but he also has character. He has faith. He has a good heart, he’s considerate, he’s understanding. And he’s also so accustomed to charming everything female that he doesn’t quite know what to do when Rowena doesn’t seem inclined to be charmed. I received a free copy of this book in order for me to give my honest review. All thoughts and opinions are my own and no other compensation was received. We originally thought of taking the train to Chicago, but couldn't find any good deals on hotels (that didn't have awful reviews), so we decided to go to a hotel in Petoskey that my parents had been to a couple of times before. We asked my sister and parents if they wanted to come. My sister wasn't able to, but my parents came. We checked in on Monday and checked out on Friday. How I found the boys at 4 am! We got about 6" of snow. I had taken pictures of everyone else, so I put the camera on the dashboard with the self timer and Dan kept making faces and I caught one!